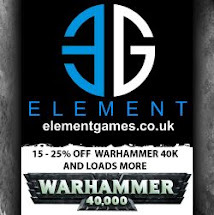 My mate Liam, he of the scratch built Warhound and Warlord fame dropped me a line the other day asking if I wanted a game. He'd only just got 6th edition so how could I refuse the opportunity to 'pop his cherry'. If you look back in the history of my gaming crew you may get a feel for how long it's been since I gamed with Liam and also the all night parties he used to hold in his house were legendary and I owe a certain amount to them that has resulted in my continued relationship with my then girlfriend and now wife, but I digress. Liam now lives near Bolton, about 40 minutes away and so I pootled up there to have our first game in about 20 years. 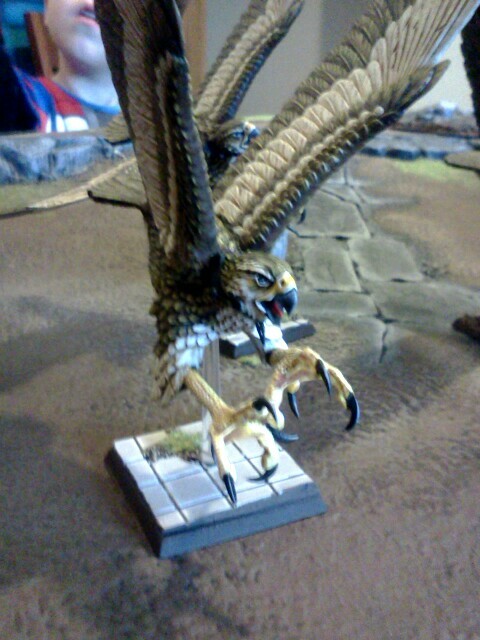 Before I get to the game here's a little treat, if you look back at all the ebay sales he's done you should know he can paint like a fiend and you can see that in these giant eagles he made out of war griffons. The full swoop of three eagles for his high elf army. 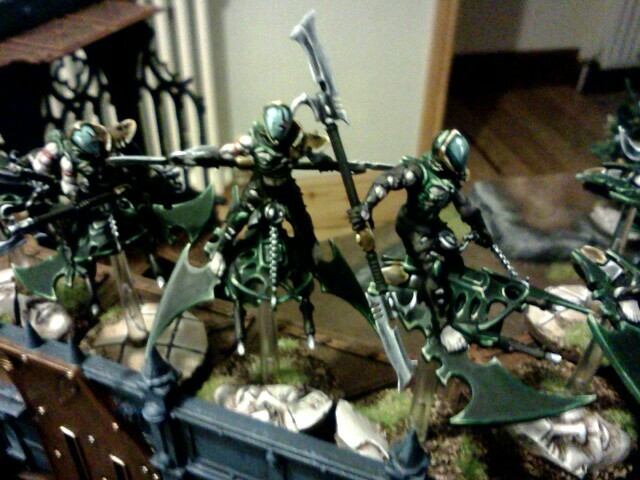 So well painted it's frightening. 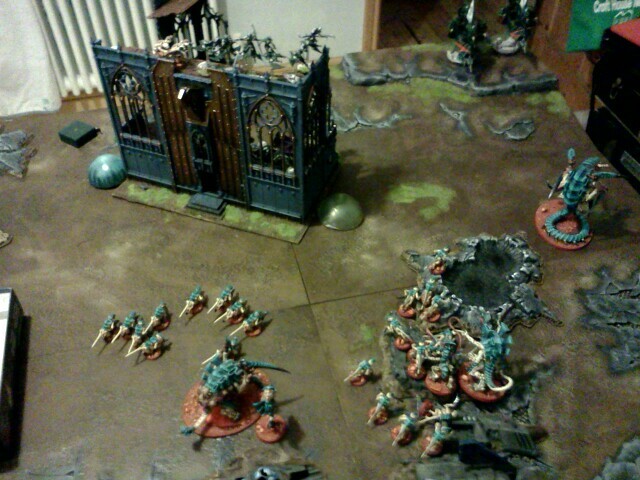 OK, so here's the battle 1,500 pts, Dawn of War setup, Purge the Alien- Eternal War Mission. 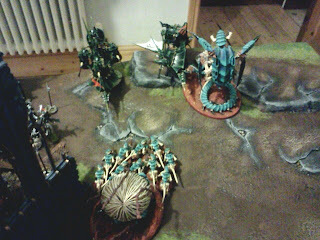 I had the 'nids, obviously and Liam was using his Dark Eldar, my first time fighting the naughty space pixies. Liam won the roll to setup and first turn. From many discussions I've had with Liam he has a firm belief he is cursed with bad luck, I therfore was hesitant to attempt stealing the initiative and confirm his belief, luckily I failed. 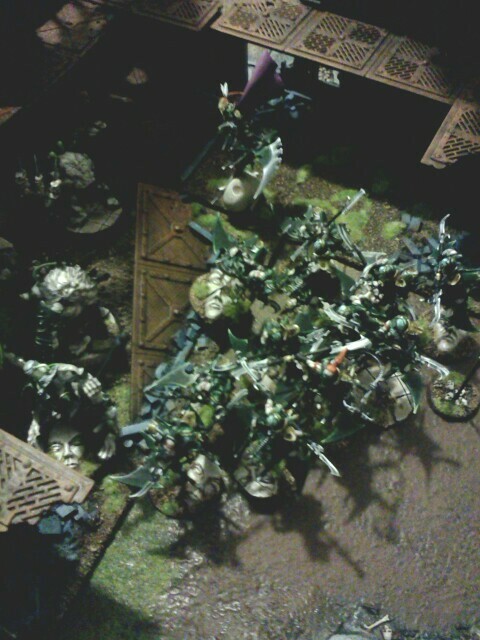 Most of my force was lined up as you see, with the adrenal stealers in the crater top left and the Ymgarls in the Shrine of the Aquila, which is where most of his Grotesques were hiding. 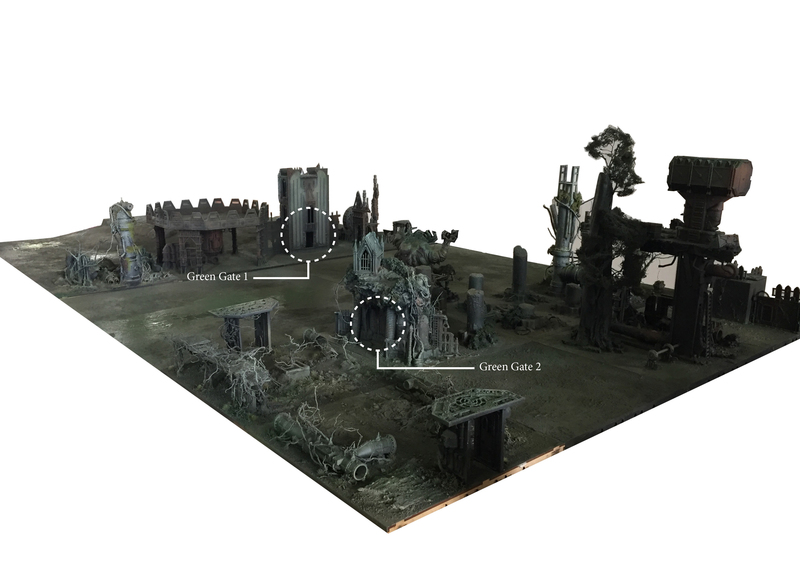 You can just about make out the Grotesques and two Ravagers in the ruin. A couple of Webway portals appeared either side of the Shrine. 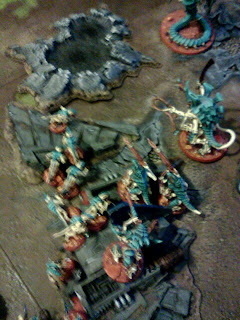 The Ravagers moved of cover and targeted the Tyranid Warriors, their high strength weapons insta-killing the entire unit. 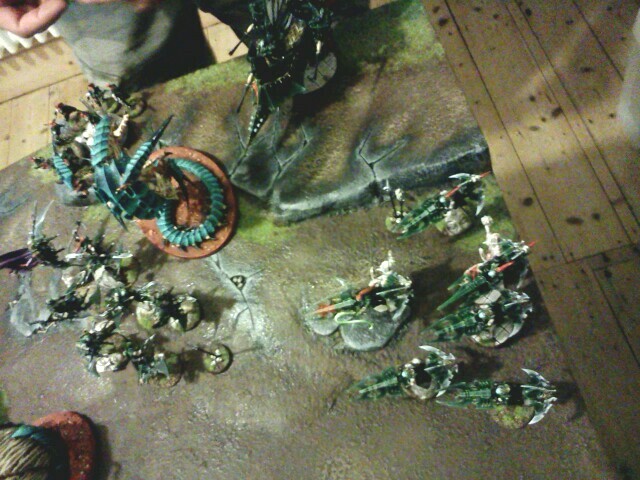 First Blood to Liam and one kill point. 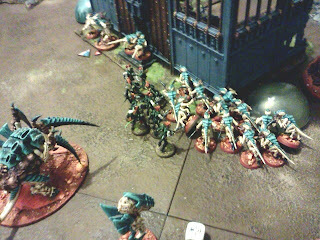 Everything of mine moved up, some shooting happened but the Hive Guard could only reach the Grotesques and managed a couple of wounds. 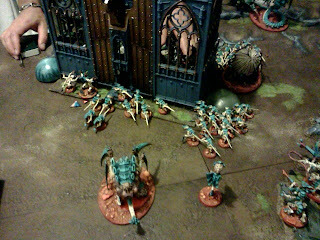 The entire unit blasted across the battlefield and deftly pirouetted to face the direction they'd come just in time to see the mass detonation of the cluster caltrops they'd scattered as they overflew the genestealers. Despite casting Endurance [the ymgarl marker was my reminder for this] on the unit only one stealer survived and the Broodlord took one wound courtesy of the cluster caltrops. 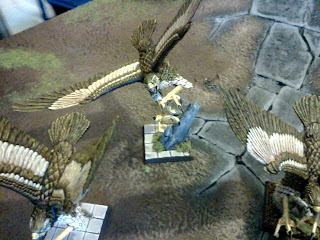 Meanwhile a unit of Helions, including his Warlord Baron Sathonyx flew into the ruined shrine, one inexperienced Helion flying straight into a girder. 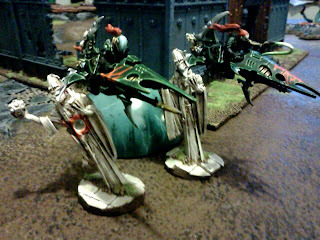 The Hive Tyrant/Hive Guard managed to put a hull point or two on one of the Ravagers, their chameleon like armour coating making them very difficult to hit. 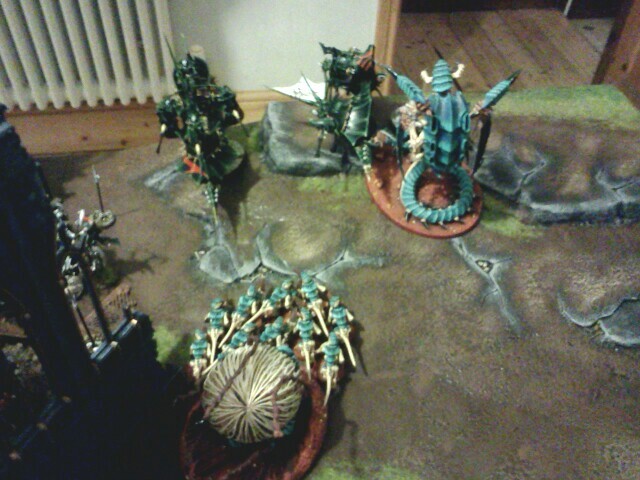 The Tervigon had spawned 10 termagants and pooped out. Inside the grim facade of the Shrine Baron Sathonyx urged the Grotesques to hold fast and let the Tyranid horde come to them. The Mycetic Spore landed just shy of being sucked into the webway portal. The Devgaunts swarmed forth and fired point blank into the Helions, doing serious damage to the flyboys and girls. Everything else converged on the ruins, ripping through the weakened walls to get at the Grotesques inside. 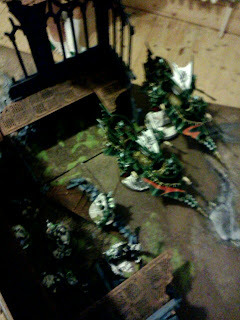 The Trygon reached the Ravager and smashed it to pieces, I'd forgotten to test for instinctive behaviour but he passed retrospectively. 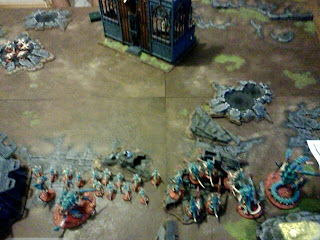 The Hormagaunts continued to assault the Grotesques but another unit of Wyches came out of the webway portal, they moved to get a decent position to assault next turn. The Termagants were down to two at this stage but were eventually wiped out as was the Broodlord and stealers. 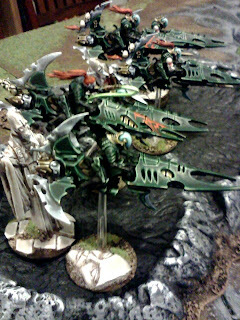 The Mycetic Spore got blasted too, if I recall and I'm guessing the Hive Tyrant given how many VPs Liam was racking up. Eventually the last chance I had was the Trygon to assault baron Sythorax and take out his unit, getting points for killing the Warlord and the Unit. 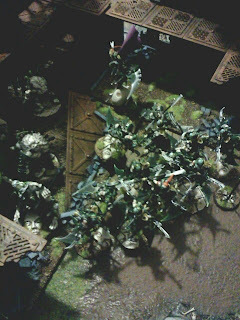 Everything was going to plan until I remembered yet again I'd forgotten to test for Instinctive behaviour and this time it failed so all the damge the Helions received would now be on the Wyches in the wreckage of the Ravager as they were the nearest target. 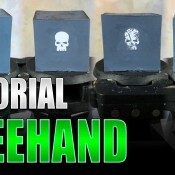 Unfortunately this would be AFTER they got their strikes due to me assaulting through cover. Thus the Trygon was slaughtered before it could even get into combat with them. In the end I was pretty hammered. 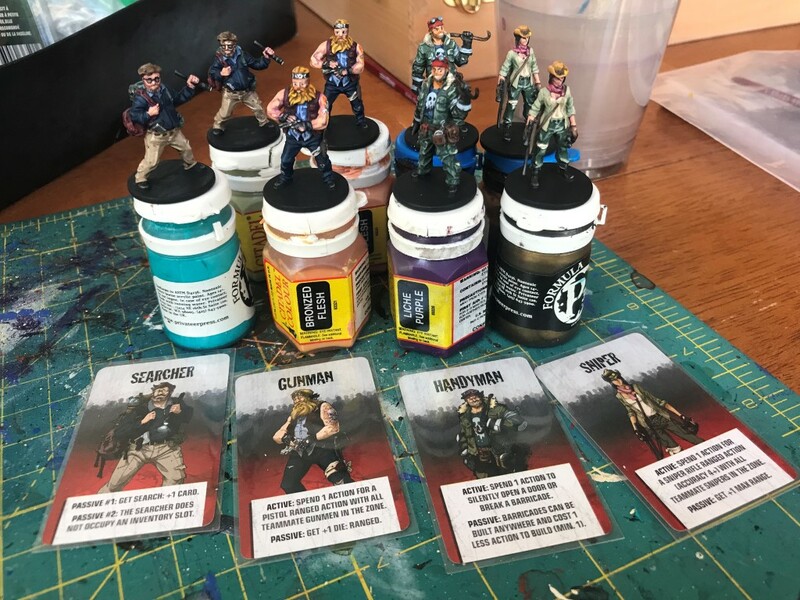 We were playing into the early hours of the morning and with the Trygon going postal on the Wyches I had little chance of salvaging any respect. 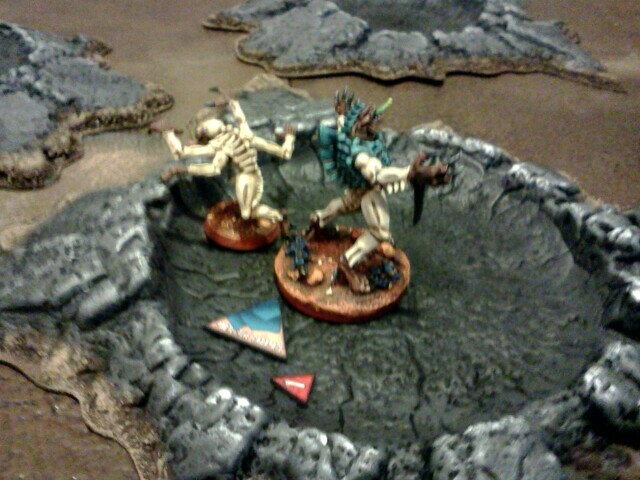 I think I'd scored one VP and had another for Linebreaker but Liam was up to about 7,8 or 9 VPs before I called it. So what's to learn from this? I setup really wrong, I'm always of a mind to close the distance, maybe once in a while I need to hang back and draw the enemy forwards, get them to commit and then steam roll in. Dark Eldar were a whole new prospect for me so I should be better prepared next time. I dunno how to counter the jetbikes, their cluster caltrops were awesome, who needs assaulting from reserve when you can drop those babies on a fly-past. I also positioned the stealers wrong and the Ymgarls got toasted by the Helions by assaulting in cover - a total waste. Not my finest hour and I have to agree Liam does roll an awful lot of 1's and I did manage a lot of 6's so I did have some advantages. Statistically there seemed a lot of anomalies but I look forward to a rematch soon and maybe making some better tactical decisions. Thinking about the jetbikes Dave, you don't really have a great deal of shootyness in your builds. The hive guard will always be a prime target for first kill. The deldar codex was written with 6th in mind hense the excess use of catrops across the board. And the trailing whippy things that raiders seem to have. There's not a lot of shootyness in nids anyway, they delude you into thinking assault because with an average of 18" range who wants to make a shooty nid army? Either way nid players are screwed which is why it will be totally unfair if we don't get to use any quad guns with an Aegis Defence Line once the full FAQ really answers the question and be a total waste of what I've been making for the bast 2.5 weeks! Hey been reading an really like your blog. 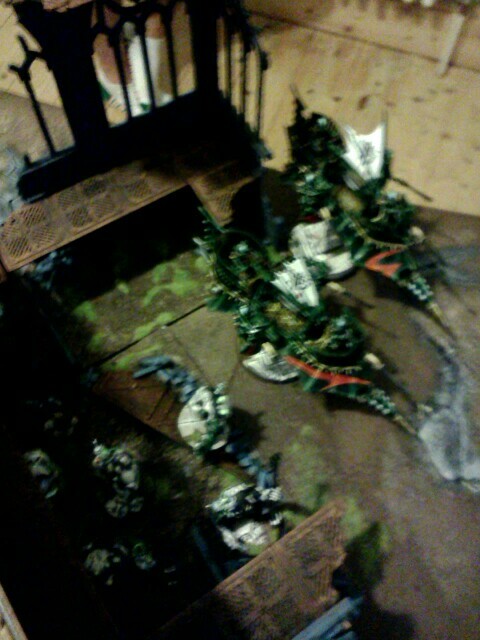 Due to somebody evidently not thinking rule repercussions through, your Trygon would have assaulted the Baron and his unit. IB: Feed just says that you may not shoot, only run if you want, and that you are subject to the Rage USR. In 6th, the Rage USR gives you two attacks on the charge - no forced movement patterns. This is a slight boon for Tyranids even if it makes no sense at the moment, though it's not as extreme as how broken it makes Death Company now! Vargna thanks for the praise and more importantly thanks for the rule clarification - you're right, I'd missed the change. It would have made no difference to the outcome, just slightly less ignominious defeat. However, having the rule fixed in my head is more important for the future so thanks for commenting.